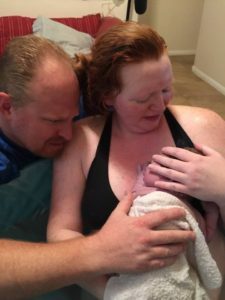 I knew before becoming pregnant that I wanted a home birth. Knowing myself, I knew that a hospital was not going to be the relaxing and calm environment I was envisioning. 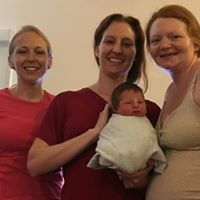 We met with a friend of a friend who had a home birth and referred us to her midwife. I contacted April and set up a meeting with her. Brian and I knew from that first meeting we wanted April on our birth team. My pregnancy was easy. I know that’s not how most people describe it, but for me it was. I didn’t have morning sickness or other “normal” pregnancy symptoms, which at times worried me–as if pregnancy automatically meant you needed to feel bad. It wasn’t until late into my 2nd trimester that I realized my pregnancy was just that…mine and it was normal. I welcomed each week and enjoyed my growing belly bump. 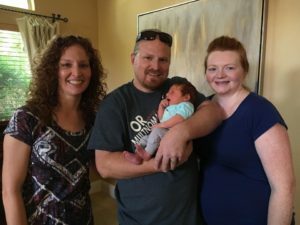 Each midwife appointment brought more knowledge as April answered all our questions and provided tons of resources that I was eager to study. I read several books and watched documentaries all of which supported my birth philosophy–birth is natural, my body was designed for birthing, and birth does not have to be feared. When it came time to choose a child birth education class we searched for one that reenforced these ideas. Hypnobabies was a good fit for us and convenient as we chose the home study option. I listened to the birth affirmations daily and the daily CDs which provided guided self-hypnosis to use during birthing. Part of this philosophy is to change the way you think about birth in the form of language so labor became “birthing time” and contractions are “birthing or pressure waves”. In addition to our midwife we also hired a doula. We felt very comfortable with Danielle and liked that she knew April and they worked well together. Later in my pregnancy we were fortunate to add another party to our team, Amy. She is a midwife in training under April. As my “due” date approached I felt confident and ready to bring my baby into the world. I anticipated going over my due date and waited patiently. 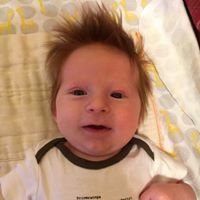 At 41 weeks, I woke up at around 2am. I felt some discomfort in my lower back. I laid there for several minutes and I again felt this same sensation. I thought, this is it! I grabbed my phone to time the pressure waves. I tried this for several minutes and realized, I didn’t know what I was doing…the beginning of a wave was clear but I couldn’t tell when it ended. I decided to try and sleep. I couldn’t. The waves were just enough to keep me awake, but I was able to stay in bed. At 4am I started timing and the waves were about 4-5 minutes apart lasting between 30-45 seconds. I knew this didn’t line up with the standard birthing timeline, but I was thinking things would pick up soon. At 6:30am I woke Brian and told him that pressure waves started. At 7am I called our doula. She suggested sleep (a recurrent theme), but I stated that I tried and couldn’t. She also suggested breakfast and a few other things that might make rest easier. I then made us French toast. I took a shower and laid down for a couple hours and was able to take a couple naps during that time. The afternoon went on and the waves were more intense, I found myself having to stand during each one. The pressure in my back grew in intensity as well. Danielle checked in every couple of hours as the waves were still somewhat inconsistent. They were 3-4min apart and lasting 45-60 seconds, but only a few lasted longer than a minute. Typically the doula comes when contractions are 5 minutes apart, lasting for 60-90 seconds, for 1 hour. When I could no longer talk through the pressure waves Danielle said she was coming over. Danielle and Amy both came over in the later evening. Sleep was the main priority on everyone’s mind, but I found laying down to be very uncomfortable. Danielle had me sit on the toilet backwards to help the progression. It was suggested that a beverage might help me to relax, so Brian mixed up a vodka cranberry for me….I didn’t want to drink it but did after some encouragement. Danielle applied counter pressure (I think everyone did at some point) to help with the discomfort in my back. This helped. I found myself contorting my body during each wave–this consisted of me stepping up onto my tip toes and pressing my palms into whatever surface was nearby. I also started vocalizing by making some low moans and ooohhh sounds. We tried some different positions, but standing seemed to be the only thing I could do during waves. 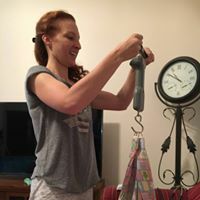 Danielle asked if she could check my progress and see how far I was dilated (she is trained in this, not all doulas are), however I didn’t want to know as I thought knowing might put added pressure on me or cause me to lose focus. Danielle respected my wishes and we decided I would get in the birthing pool to try and relax/nap, it was around 1am. Everyone went to sleep and I relaxed in the birth pool, which was nice, but extremely hot. I stayed in for about 20min before I had to get out. I tried to lay on a mat on the floor, this was very uncomfortable. I then went to lay down with Brian, this was better as I was near him and he was supporting me, however the waves became more intense. There were two times I thought “I don’t think I can do this”, This was the first occurrence…I didn’t say it out loud but the thought came to my mind; I quickly dismissed it and thought–I AM doing this. At this same moment Brian told me how strong I was and what a good job I was doing. I needed that! He then suggested that we get up and walk around the kitchen, we did. Around 3:30am I said I would try the pool again, while Brian rested. I got into the pool and the temperature was perfect. It was relaxing in the water, the waves continued and I continued to get through them with movement and vocalizations. At around 5am everyone began waking and came to check on me. It’s at this point that I started to fade out as if I was in a dream. I could see everyone and hear the conversation, but I was no longer able to interact with everyone. It took all my energy to concentrate on the waves. Danielle asked once again what I thought about checking my progress, I again expressed that I didn’t want to know and she said she understood. I got out of the pool to go to the bathroom and tried some different positions. April was notified and arrived shortly after. I remember hearing her voice, calm and reassuring. She fed me bites of banana. I wanted to say how happy I was that my whole birth team was there, but nothing came out. After some time I was able to say I wanted to get back into the pool. They helped me. I then lost all track of time, what seemed like a few minutes to me was an hour and once I got back into the pool I had no idea how long I was there. I turned into myself even more, each wave required more of me, my body took over and moved itself into positions that were more comfortable. Amy read birthing scripts, which I heard and they reminded me that I could manage each wave. Danielle put warm water on my back, cool wash cloths later, and I’m pretty sure she even put my hair up in a bun when it started falling down. I could detect April’s voice through my own primitive noises as she reassured me that I was bringing my baby down and I was doing good work. April is a great observer and skilled at watching and waiting. I remember her coming over to me and saying “I hear you making a grunting noise” and then suggesting that the next time that happens I can begin bearing down/pushing if I feel like it. I was relieved to hear this but, I couldn’t express it….I thought finally!! During these waves, my body took over and began pushing on its own each time I would bear down. Brian fed me some energy gel to fuel this hard work. 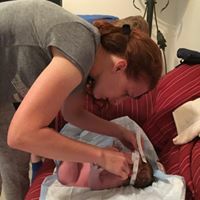 After some time, April prompted me to feel my baby’s head if I wanted to. I reached down and felt a small, round, head, but squishy still inside the bag of waters. It was small, but I was glad that my baby was moving down. I was feeling a lot of pressure with each wave and my body began moving onto my hands and knees during each one. My team coached me on breathing down and letting each wave go. April prompted me to check my baby’s progress again and I felt more of the head, still in the sac. I don’t know how much time had passed when April again said the head is right there, feel again. I felt but this time it was almost a whole head! Still squishy, encased in the amniotic sac. This is the second instance in which I thought to myself…”I don’t know how much longer I can do this”, but again I let the thought drift from my mind as I prepared for the next wave and thought to myself…this is it my baby is coming. On the next wave by body pushed with three mighty pushes and I felt my baby moving down and out. 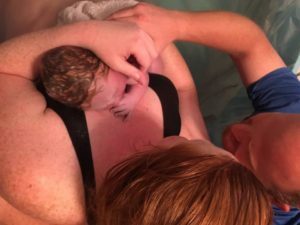 I reached down and brought my baby up out of the water to my chest (after removing the nuchal cord). This feeling overwhelmed me of pure amazement, my hands being the first to touch my baby, my body doing exactly what it was designed to do. I did it! With my birth team, I welcomed my baby into the world in a peaceful, calm way. I then checked and announced (rather I thought I announced it, but apparently it wasn’t audible) it’s a boy! The first thing I said out loud was…”it was all worth it”. A sentiment so completely true. All pressure and discomfort immediately disappeared. I will never forget the overwhelming sense of accomplishment and joy in meeting my baby boy. I had never felt so strong and empowered as I did in that moment. We enjoyed several minutes of skin to skin time, while we allowed the placenta to detach and umbilical cord to stop pulsing. April examined the placenta to ensure it was intact and it was. Brian cut the umbilical cord and Danielle began the placenta encapsulation process. I got out of the pool, I felt great. Brian held our baby boy for the first time (and checked for himself, that it was in fact a boy). April checked me and I had a very small tear that didn’t need stitches. I could walk around and was completely comfortable. After April completed the newborn screening, me and Brian snuggled with our new baby in our bed. Being in our own home, surrounded by people we know is something I wouldn’t trade for anything. I am convinced this is the best way to birth for me…and I wouldn’t want it any other way. A Mommy was born along with, James Connell, at 10:17am on 04/17/16, weighing 8lbs 13oz and 21 inches long, approximately 32 hours after the first pressure wave.